Quench your thirst with these delicious Benihana craft cocktails, available at Benihana Fashion Show now through May 13th. A sweet concoction of Absolut Mango, Stoli Raz, raspberry puree and cranberry juice. 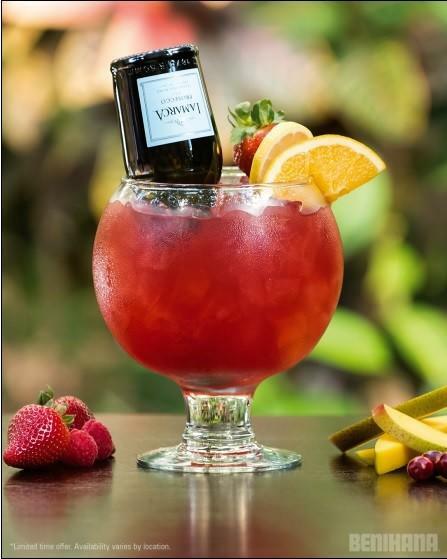 This beverage is especially unique when you choose to top it with a bottle of La Marca Prosecco. A combination of Malibu Coconut Rum with coconut milk, vanilla syrup and matcha. Matcha is a green tea powder with numerous health benefits and gives this cocktail a rounded, earthy balance. This beverage is shaken vigorously and served over ice with a toasted coconut flake garnish. Astral Blanco Tequila, lime agave sour and prickly pear puree with a float of Grand Marnier. These wines pair especially well with seafood and sushi, but may be enjoyed with any item from the Benihana teppanyaki menu. Delicately pink in color, Meiomi Rose is delightfully dry with delicate aromas of watermelon and strawberry. This classic Marlborough wine is bursting with crisp citrus and passion fruit notes. Deliciously refreshing with a fresh palate.